Manchester United will surely want to take note of transfer news emerging today regarding Atletico Madrid star Antoine Griezmann. 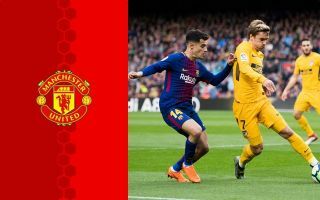 The Red Devils are on the lookout for top class attacking players this summer as flop signing Alexis Sanchez will surely be leaving and needs replacing with a big name. It’s been claimed Sanchez will most likely be sent out on an initial loan by Ole Gunnar Solskjaer, though only if they cannot find someone willing to buy him permanently. Meanwhile, potential replacements, according to the Independent, could be big names like Borussia Dortmund wonderkid Jadon Sancho or former Liverpool man Philippe Coutinho, who seems likely to be allowed to leave Barcelona. Griezmann, however, is also a target for Barcelona this summer as the Daily Mirror claim that on June 1st his release clause drops from £170m to £102m. That should be perfectly affordable for Man Utd should they wish to join the hunt, and it seems likely they will given their past interest in the player. Griezmann was strongly linked with the Premier League giants two years ago, though they were prevented from getting the deal done due to Atletico getting a transfer ban, meaning he stayed loyal to spare them being unable to sign a replacement. Now, however, the Mirror claim he wants to leave following the club’s Champions League exit at the hands of Juventus.